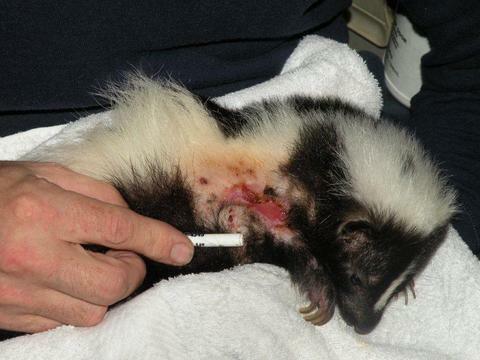 You can help provide care and treatment when you Sponsor-A-Skunk. 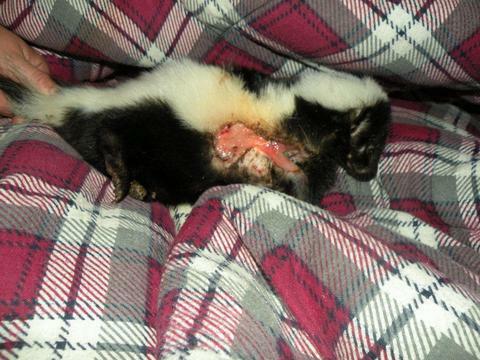 When you contribute to Sponsor-A-Skunk you help skunks that require daily or costly medical treatments or special care. 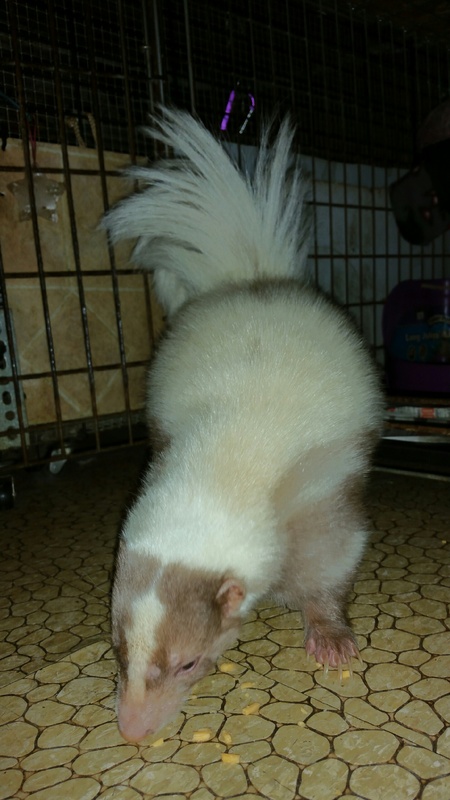 For those who cannot adopt a skunk into their home, Sponsor-A-Skunk gives you a chance to provide care for one of our long-term resident skunks. We pay for the best veterinary care available, but those costs do add up. A vet visit costs $45.00, full blood work costs $130.00 or more, X-rays costs $120.00 or more, and other tests can be even more expensive. In addition, operations or dental may cost $120.00 to $1000.00 per skunk. Dietary supplements and medications add even more to the costs for care and treatment. Just $10 a month helps to pay for food, medical treatments, and other necessities. 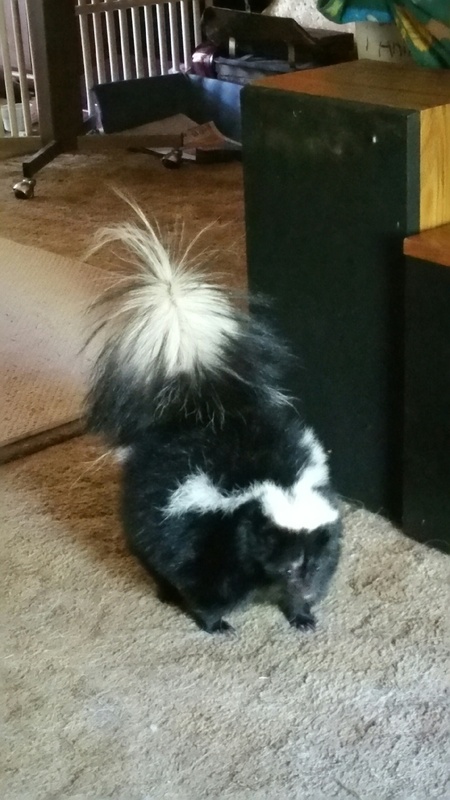 You can help by sending $60 for a six month term, or $120 for a one year term, to sponsor one of the rescue skunks. In addition, you may consider a Lifetime Sponsorship at $1000. Term sponsors receive an acknowledgment certificate, and updates on the progress of the skunk sponsored. Lifetime sponsors receive an acknowledgment certificate, a painted portrait of the sponsored skunk, and timely progress updates. 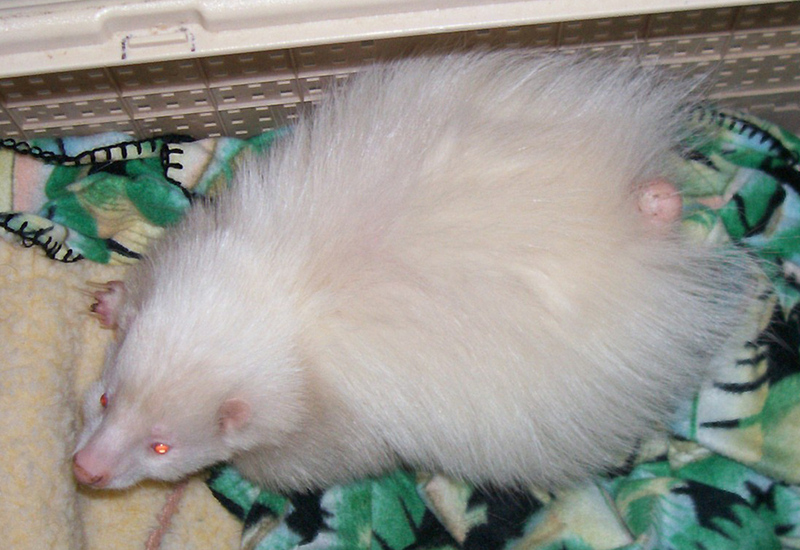 In addition, sponsors may donate toys, blankets, or other items for the exclusive use of the skunk sponsored. If you wish to contribute you can send your check to Skunk Haven™ or send to our PayPal account (see below). Note the skunk you wish to sponsor and include your current mailing address and phone number. If you want more information about Sponsor-A-Skunk or a specific skunk please contact us. Her owners moved to an illegal state. Teddy Bear was sold by a broker, then the owners did not want him any more so they took him back. The broker sold Teddy again to another family where Teddy thought he had a home. However, soon the family did not want him any more and they called Skunk Haven. 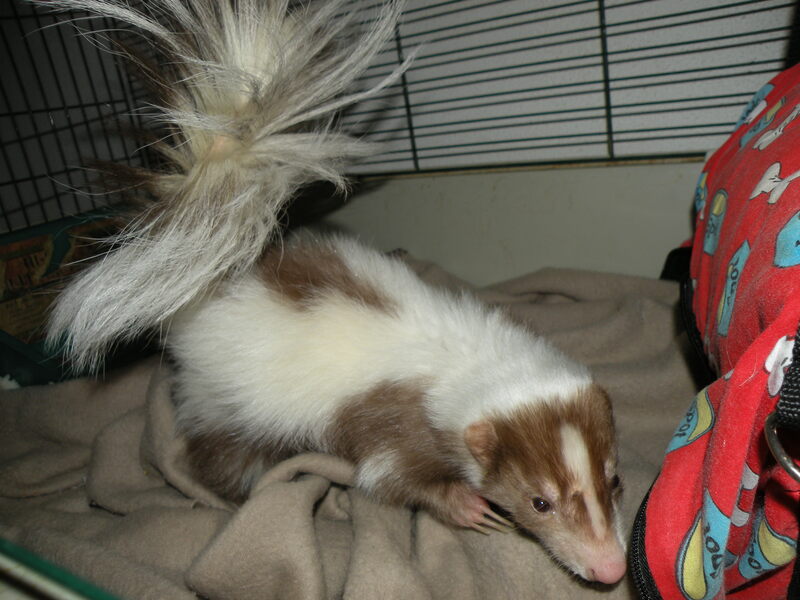 He will remain out his life in a loving home with the Skunk Haven family. 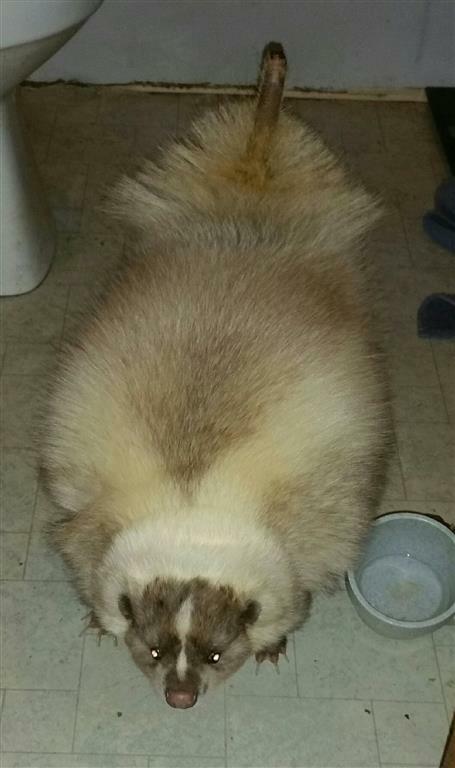 Sterling is a self mutilating skunk. His owner gave up because they could not control his behavior. Minion owner divorced and had to give him up. Hank has been given up twice in one year. 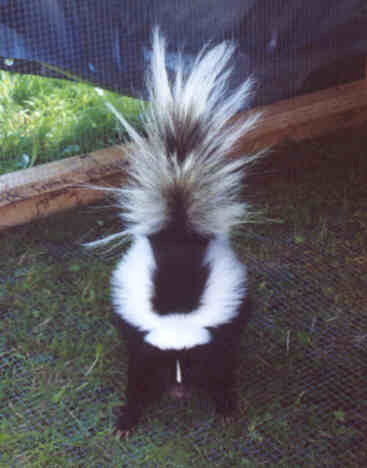 Skunkers - This skunk was taken out of the wild as an orphan. 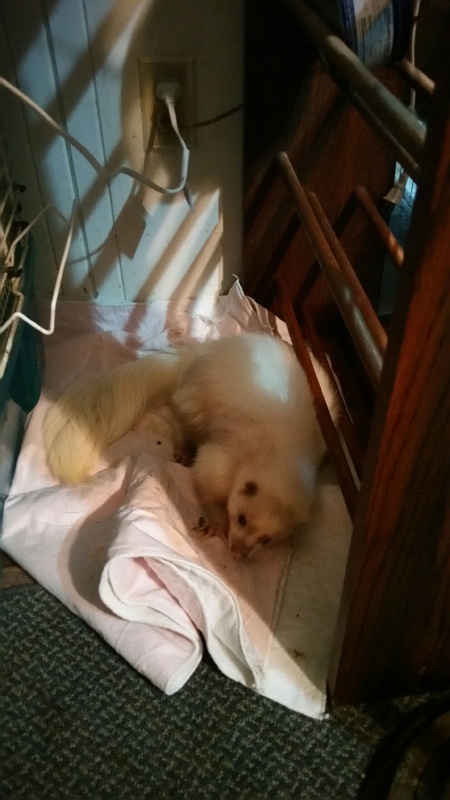 The family thought they were doing something good to save this skunk. At the age of 1.5 years old she got burned very badly from a home radiator. 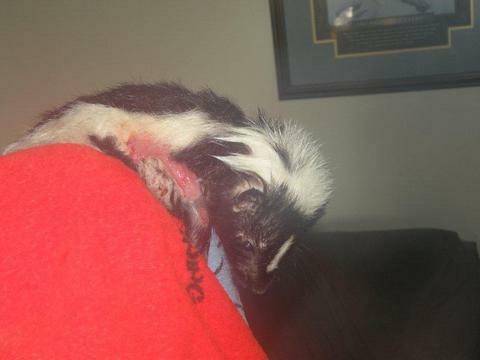 The family did not provide the proper care nor did they get vet care to save this skunk. 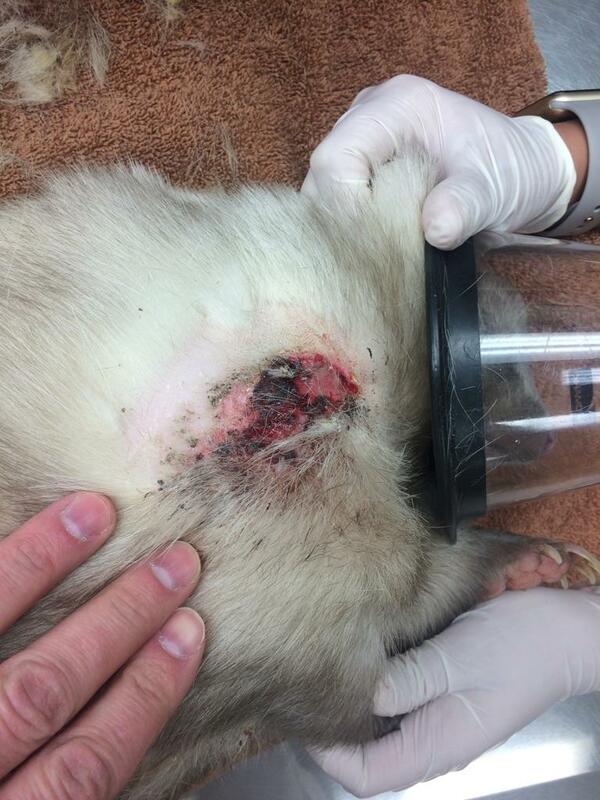 She suffered terribly for almost two weeks with the burning pain and infection setting in. 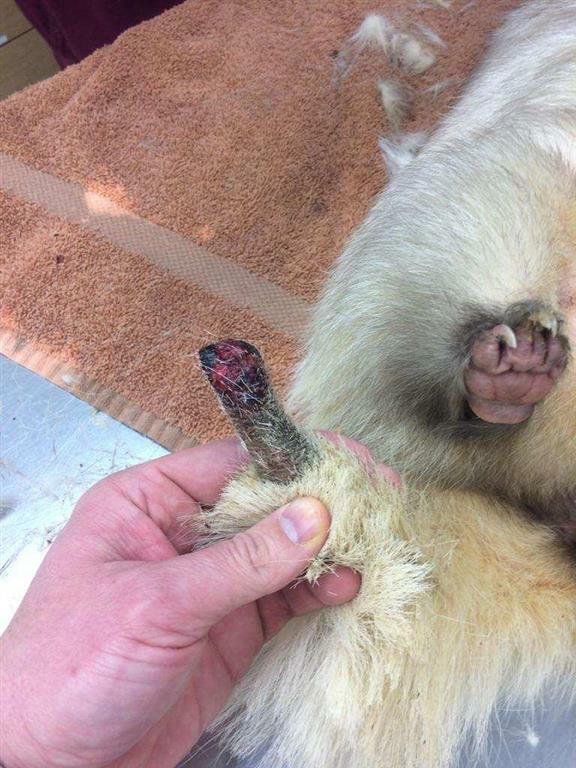 The diameter of the burn was over 5 inches around and she was under weight at three pounds. She was signed over to Skunk Haven, a licensed wild life rehabilitator. We rushed her to a vet: Dr. H. S. Sodiwal, DVM at Rolling Hills Animal Hospital located at 714 Pearl Rd., Brunswick, OH 44212 where he preformed surgery. (The ex-owners refused to help pay). 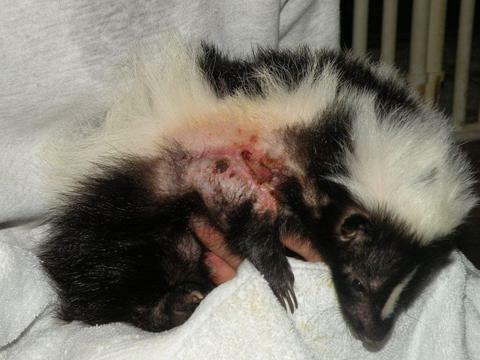 She then went to Lisa's home (Lisa cares for the wild side of Skunk Haven and is on their rehab permit) and was given 24/7 care due to how severe the burn was. She would spray continually, bite, scream and would not eat. 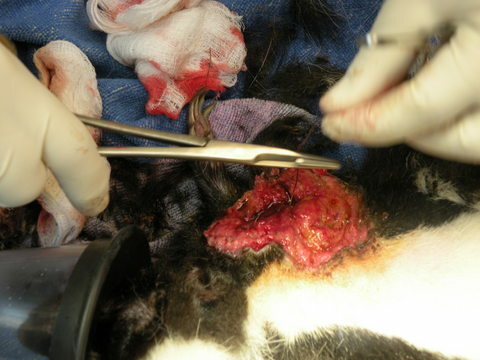 She was setadated and given many antibiotics along with honey wraps to draw out the infection from her burning skin. 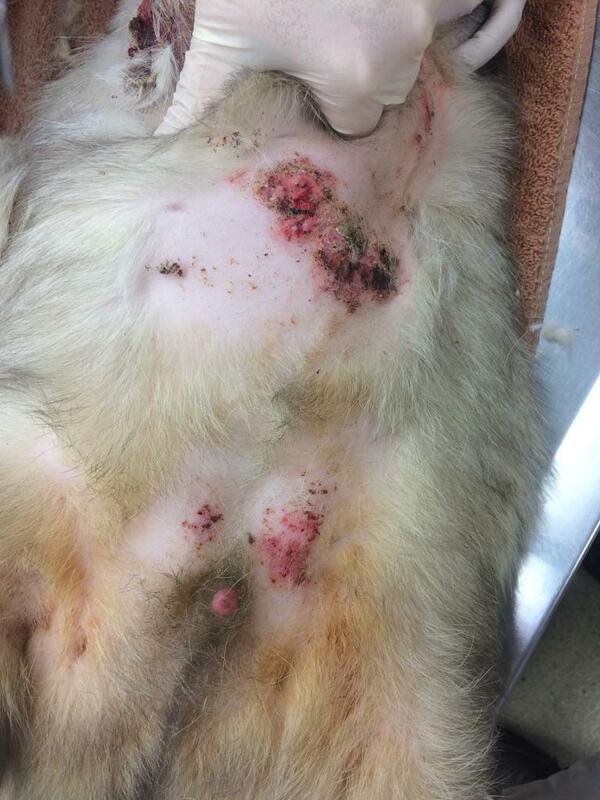 We were dealing with a fully loaded skunk, she was malnourished, had a burn through her leg, had an infection, was not eating, not spayed, was self mutilating, not walking, and had bone problems. 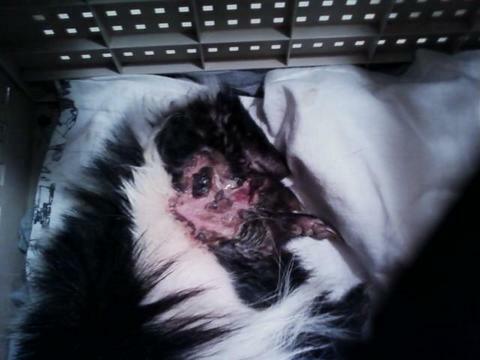 After a month she was moved to Skunk Haven where her care was continued. Finally her screaming and self mutilating stopped. She was given many herbs for healing the body from within, had colloidal silver sprayed on the burn along with Epsom salt and/or Betadine soaks to her wound every day. Finally after three months she started to stand and walk. Every day she continues to get stronger. Due to laws if a wild animal is non-releasable they are to be put down, unless they are used by a licensed facility for educational purposes. 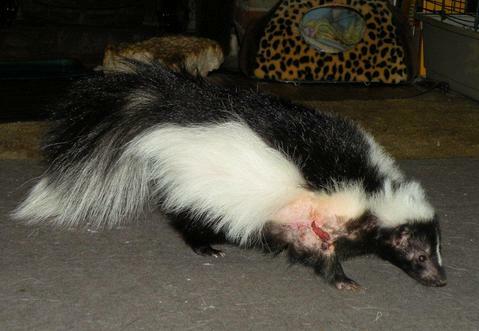 SkunkHaven was granted permission to retain Skunkers to be used as an ambassador to teach the public the pitfalls of taking in wild animals. PLEASE DO NOT TAKE WILDLIFE OUT OF THE WILD TO MAKE THEM YOUR PET! If you would like to donate on Skunker's behalf (see below). Eventually there comes a time when we lose our long term residents to age or their ailment. 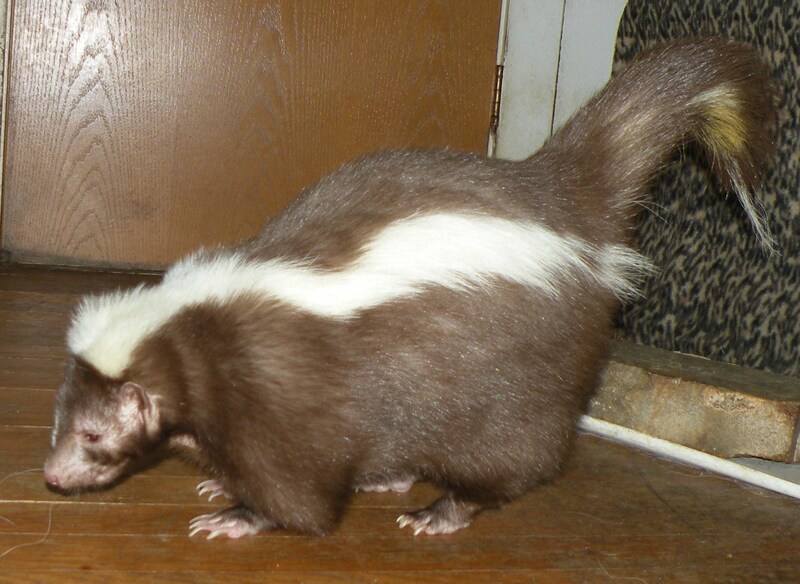 When paying by PayPal you will be contacted via e-mail to identify the skunk you wish to sponsor. Gift Certficates will be used for skunks at our rescue and will free up money for other rescue efforts and medical problems with needy skunks throughout the U.S.
© 2004-2025 Skunk Haven™ Skunk Rescue, Shelter, and Education, Inc.